The bed is the actual cake so I baked it in a large rectangle pan. Then cut it in half, iced with butter cream in the center and stacked them. I then iced it with white butter cream. I used a round tip to make the yellow squares on the quilt. Filled them in with the yellow frosting. The board is frosted in brown butter cream so it looks like a wood floor. 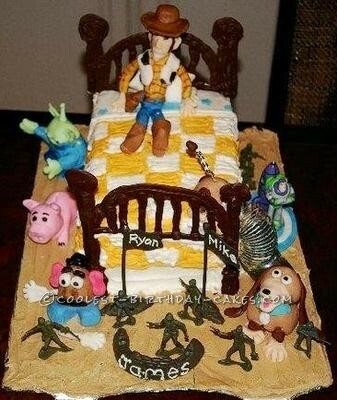 The characters are all hand sculpted out of fondant. 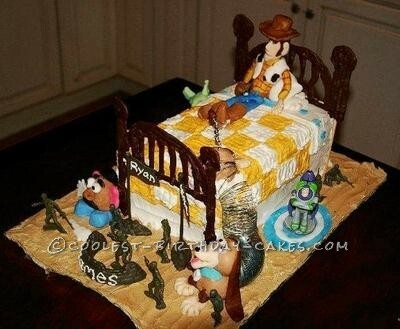 The only ones that are not sculpted are Buzz and the Army Men. The headboard and foot board are out of melted chocolate chips. I traced out a pattern onto the back of wax paper. I then piped the melted chocolate over it and let it dry. Then attached it to the bed with some fresh butter cream!